Rejoice, one and all: The Tyrant King is no more! For six years, the once-great kingdom of Ursa Madeum suffered under the bloody rule of Damien Gillick. The madman seized the throne after the disappearance of beloved Queen Decameron, shutting off the islands from the rest of Terrenus by a magical blood barrier created from the murder of thousands. Now, over a year has passed since the Veluriyam Empire overthrew King Damien and took the islands under their wing. Ursa Madeum, reborn from the waves, continues its slow return to its former glory. However, the waters remain turbulent. Pirates plague the waters of the Southern Sea. Unrest grows towards the foreign rulers sitting on the throne. Ursa Madeum’s old noble houses quietly pursue their own goals, navigating a complex web of conflicts and alliances. In these times of turmoil, Ursa Madeum’s future seems uncertain, its present steeped in political intrigue. Welcome to Valucre’s own game of thrones. Have a Joyous Reverie! - The Veluriyam Empire's holiday celebration, Reverie, is currently being held in Andelusia. The Reverie Ball is currently in progress and open for all to attend. 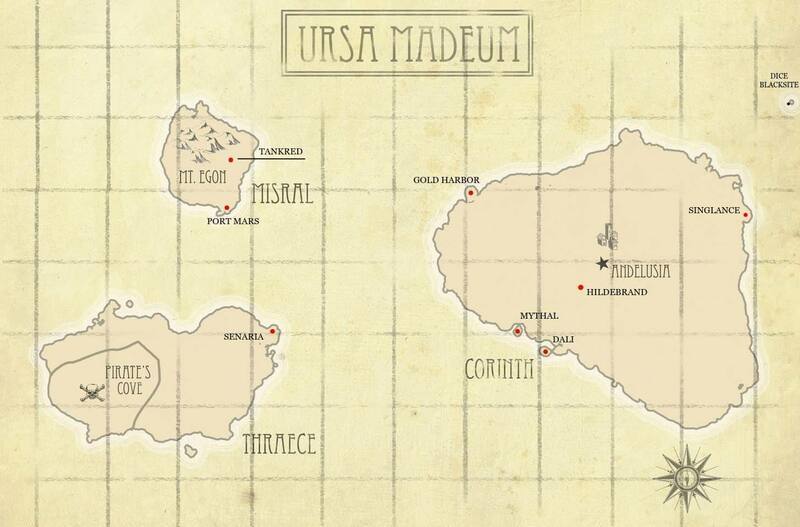 Ursa Madeum is a small archipelago off the south coast of Terrenus. It’s three main islands – Corinth, Misral, and Thraece - are set in a vaguely triangular formation, with several islets located in between. Corinth, the largest island at approximately 4,000 mi­2. It is in the west and holds the capital city Andelusia. It remains the most populated island of the three, as most of the noble houses’ estates are located here. Most of the cities in the center of the island, however, are deserted. Thraece, the second-largest island at 2,200 mi2, is in the southeast. Only a few coastal towns on its eastern coastline remain inhabited, with the population barely reaching a thousand. The presence of House Senaria’s Port Kyros has helped bolster Thraece’s fading economy, though the western parts of the island remain largely unexplored. It is rumored that a city of pirates and bandits exist in the far west. Misral, northeast of Corinth, is the smallest of the three islands. The smoldering peak of the volcano, Mount Egon dominates Misral’s landscape. Despite its harsh, mountainous terrain, Misral is rich in mineral resources and is home to a healthy metalworking industry. The once-populous kingdom has been reduced to a scattering of settlements clustered around the estates of the Noble Houses. Most of Ursa Madeum's population began migrating to the areas surrounding the nobility’s domains, seeking the stability and protection provided by swearing fealty to a Noble House. These estates are now the emerging centers of trade and commerce, especially those located along the coastlines. The areas in the middle of the islands, however, are dotted with empty villages and ghost towns. Nature is slowly reclaiming these ruins at a rapid rate, boosted by the strange life magic from Taen that now permeates Ursa Madeum. Travelling between cities is dangerous, especially since the gangs of thieves and bandits that flourished during the Tyrant King’s reign remain numerous. Ursa Madeum experiences a subtropical climate due to its location near Valucre's equator. The weather is fair year-long, the temperature peaking during the new year (June). There tends to be heavier rainfall from November to April and a dry season from May to October. Pirate’s Cove – a city of bandits and pirates, center for smuggling and illegal activities in Ursa Madeum. Ursa Madeum is an aristocratic monarchy under the authority of the Veluriyam Empire. As there is currently no ruling monarch or royal family, Emperor Titus Demetrius and Empress Rozharon Paralios stand in as the Royal House. Ranked directly under the royalty are the Noble Houses - a class of prominent, influential families in Ursa Madeum who hold considerable land and authority. Most of the Houses are old and deeply rooted in the kingdom's history. Many attained nobility through wealth, power, or military strength, though there have been cases where nobility is honorary and bestowed by the royalty, as is the case with House Singlance and House Senaria. There are two ranks of nobility – Major Houses and Minor Houses. Major Houses are those who have the most authority as recognized by Veluriyam. They are seen as representatives of the people, allowed a say in national matters, and are given considerable freedom in ruling their territories. Minor Noble Houses are ranked lower than the Major Houses. While still allowed to own land and authority over their estates, they are subject to direct rule from the Royal House and not allowed representation in national gatherings. The heads of Major Noble Houses hold the titles of Duke and Duchess while Minor Houses, Count and Countess. Titles vary between Houses, though, with Lord and Lady used more commonly to refer to nobility. While not nobility, there are also prominent families that hold significant social and economic power, usually in the form of land. These compose the Aristocracy, a social class directly below the Nobility. The heads of Aristocratic Families hold the title of Baron and Baroness. In some cases, a family of the Aristocracy will choose to pay homage to one of the Noble Houses, swearing loyalty to them and them alone. These are referred to as Vassals. After Queen Decamron's disappearance, many Houses turned to support the Tyrant King and the abuses under his rule in desperation to retain their status. These Houses were either exiled or executed after the Veluriyam Empire overthrew Damien. Shortly after, the Veluriyam Empire granted noble status to two foreign houses: House Singlance, and House Senaria. In the days of old, Ursa Madeum flourished under the rule of Queen Analea Decamron. Ursa Madeum prided itself on its culture heritage and education exemplified in institutions such as the Andelusian Opera House and the Metropolitan Library. Despite the existence of occasional internal conflicts between the noble houses, Queen Decamron kept peace between parties. The following six years were the darkest for Ursa Madeum. King Damien quickly gained the moniker of the Tyrant King, exacting heavy taxes on the people, implementing forced labor, and demanding a share of all goods be turned over to the government. The once-prosperous kingdom became destitute. Many of the noble houses sided with the King, gaining his favor, riches, and avoiding the abuses inflicted on the commoners. The few that chose to fight suffered. Many became victims of the countless public executions that the Tyrant King was so fond of. Still, the Tyrant King’s hunger for power remained unsated. Despite his iron grip on the islands, he remained paranoid that an outside nation would put a stop to his madness. A year after his coronation, a Damien sent the Black Knights to round up every non-human on the islands – elves, pereds, and shifters – and sacrificed them in a magic ritual. This created a nearly-unbreakable blood barrier that enclosed Ursa Madeum, preventing anyone from getting in or getting out. Despite various efforts from the outside world, none could enter the islands to put a stop to the Tyrant King’s madness. However, rumors tell of the Suujali, smugglers who used a rare material to help refugees escape through the blood barrier and to Terrenus mainland. But not all refugees made their way to freedom: some were sold underground slave rings as part of human trafficking operations. In the year 595, the blood barrier weakened when the pocket dimension of Taen anchored itself to Terrenus. The interdimensional nature of its portals destabilized the blood barrier, allowing a group of refugees to escape. Once Emperor Titus of Taen received word of Ursa Madeum’s situation, he led his army to the islands, found the barrier weakened, and shattered it. In 596 WTA, the Taen military entered Corinth in secret and began invading the island. After a six-month campaign, Taen broke into Andelusia, overwhelming the Black Knights, and charged for the castle. The Tyrant King learned of Taen’s presence too late; he was decapitated by a Taen general and burned to ashes. The Taen Empire took control of Ursa Madeum, immediately distributing resources to the commoners and sending an influx of citizens from Lunaris to help rehabilitate the kingdom. The land of Taen’s influence began seeping into Ursa Madeum as well. The islands’ wildlife seems to grow supernaturally fast, resulting in bountiful harvests and empty cities growing into forests. Blue worldrift portals began appearing, tearing holes into other worlds, only to vanish as soon as they arrived. The Taen military’s Argonaut 002 now also protects Ursa Madeum, keeping the peace.